Combines SD2IEC and 8Kb (fastloader) cartridge. Two LEDs to show activity and error. Uses an uSD to store diskimages (D64). Up to 8 different cartridges (dip-switchable). Uses EPYX ™ cartridge hiding (selectable). 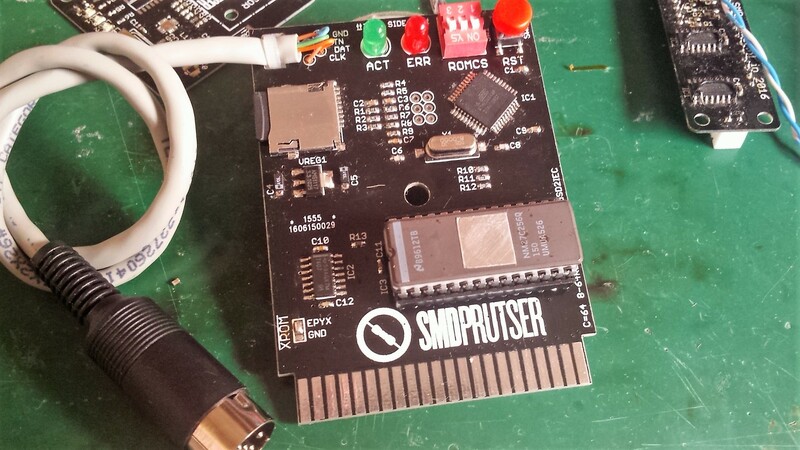 The cart is a LARSP-64k implementation of SD2IEC with a push-push uSD cardslot. The drive ID can be set with a solderable jumper to 8-11 and it has solderpads for the diskchange buttons. The other part consists of an EPROM (27C64 upto 27C512 can be used) used to store a fastloader or utility. Upto 8 different ROMs can be used (selected through a DIP switch). Another DIP switch selects the cartridge mode (ON (EPYX mode), ON (8KB standard cart) or OFF). The EPYX mode will switch the ROM out of the adress space and give back the memory region at $8000. It took a while to come to this more or less final version: proto 1, proto 2 and proto3. Use the contact form if interested in getting built one.